I've been growing sage in a pot in my garden for years. It comes back every year, thicker and stronger. As it begins to get colder I cut some of it down and brought it inside. The sage is a beautiful green and the only thing better than the way it looks is the way it smells. I put a mason jar inside this galvanized oil can and filled it with water hoping the sage will last a long time indoors. 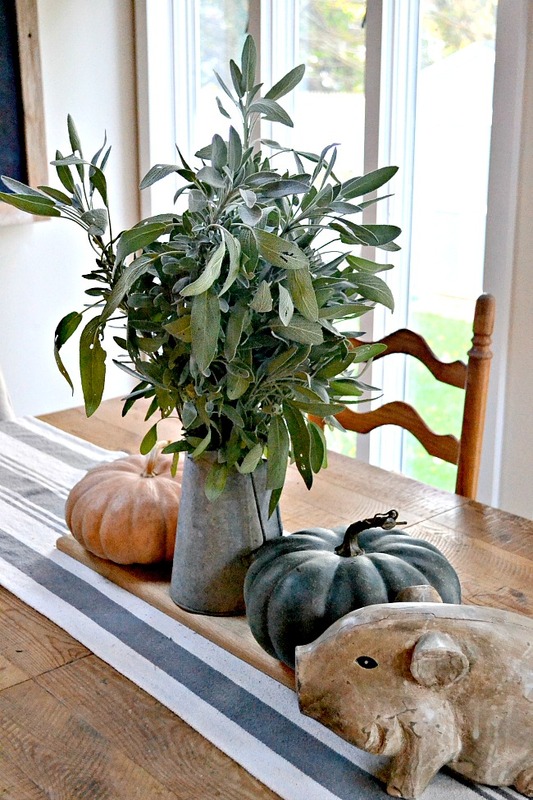 Paired with pumpkins, it makes a gorgeous fall centerpiece for a harvest table. Can you tell which of the pumpkins is real and which is fake? I know it's hard! Before it freezes I'm going back outside to see what other greens I can bring in. Very pretty, Susan...and you've reminded me it's time to pick things in the garden...in Minnesota we're way past our normal freeze time. Brrr Minnesota! Luckily we've only had one freeze so far but I brought in everything I want. Stay warm! I love sage. I plant it every year. Sometimes it comes back, sometimes not. Mine died out in the heat here, but I look forward to seeing what herbs pop back up come spring. What a great idea you had here! I'm sure it smells heavenly. Hey Brenda! Unfortunately the sage wreath didn't last more than a week before it got very sad looking but the sage in the vases are still going strong! The smell is heavenly for sure! First I love your table and that sage is beautiful. We're getting ready to sell so I've been propagating my herbs because I sure will miss my current bed. 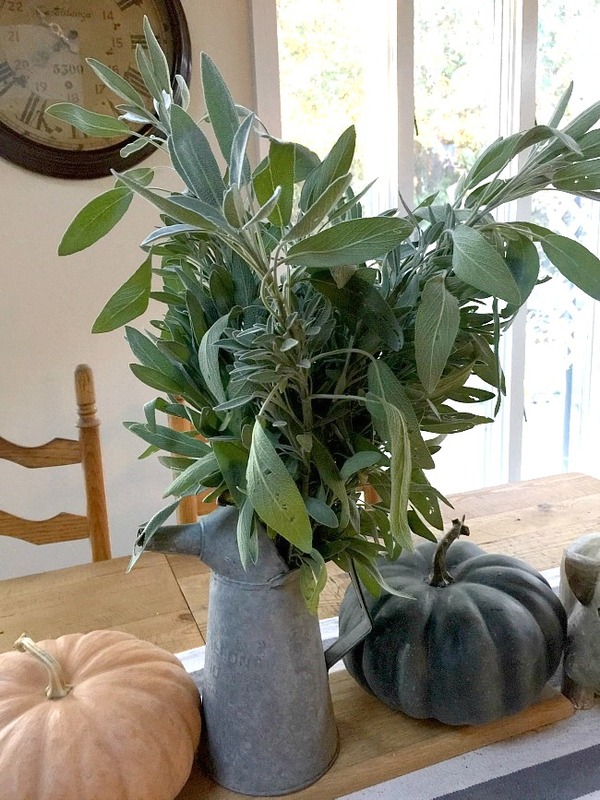 Especially the sage, it's tasty, healthy and beautiful for decorating the home. This is a nice centerpiece and I love the simplicity. Thanks so much Carole. I love my table too, it was a big investment from Pottery Barn several years ago. It has 2 very large leaves as well which is coming in handy when we turn the table sideways and it goes across the room on Thanksgiving. My family is growing and the table is perfect. 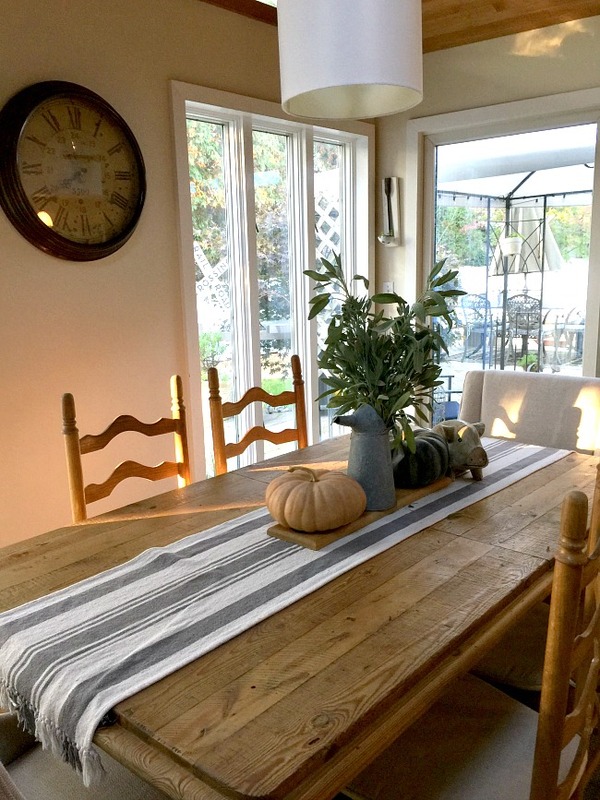 Where did you get that gorgeous table runner? 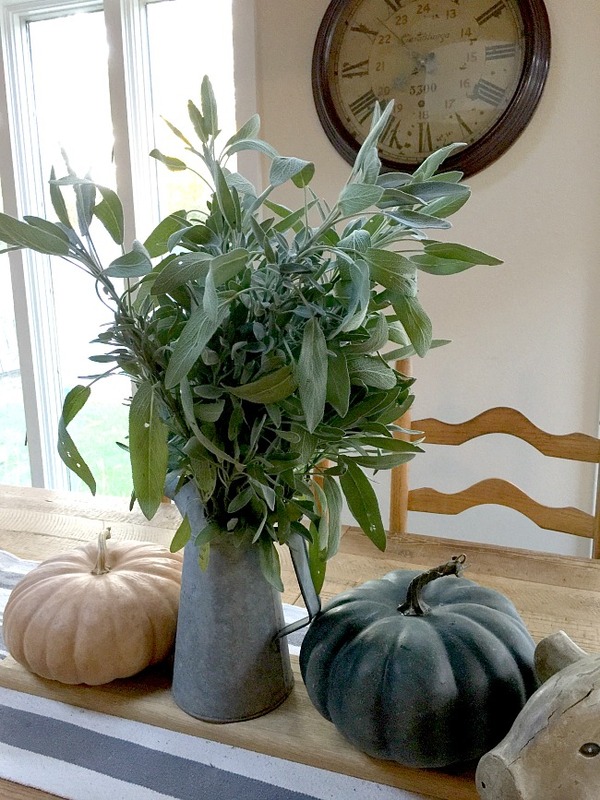 It looks fantastic on your farmhouse table!! Thanks Candylea, the runner says Nicole Miller... I'm pretty sure I got it at Marshalls or TJMaxx last year. I was wondering about your table runner, love it,simplicity does it for me. Your dining area is flooded with gorgeous light with windows and back door, nice view also. Your table is incredible, well appointed investment for many years. Wonder if I could grow sage here in western CO, gets so hot here in summer? 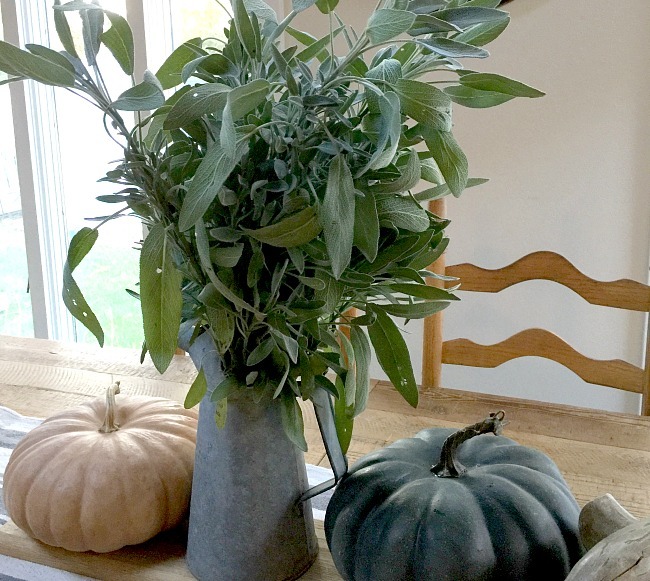 Is sage a shade or sun plant? Wish Sam's Club would sell table runners.They used to sell alot of Nicole Millers clothes but haven't seen any in about 3 yrs. Guess will have to visit T.J. Maxx, don't have Marshalls here in Grand Junction. Where did you get your wooden pig? So cute! Beautiful...and that little wooden pig is adorable!